This entry was posted on December 29, 2016 by wp_admin. It is almost summer camp time! 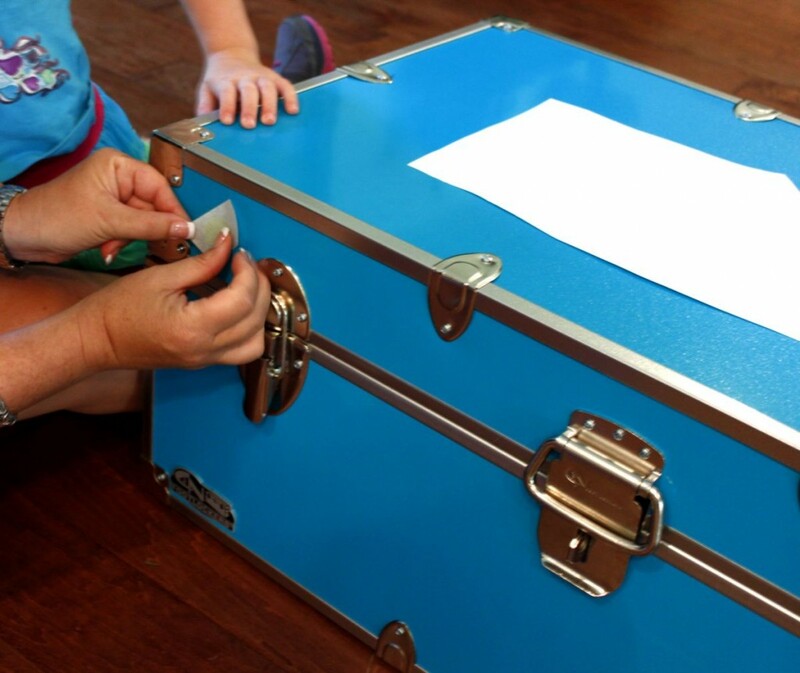 And it is past time to create your personalized summer camp trunk with one of our many decal designs! This step-by-step decal application guide will show you how to go from bland to awesome in just a few steps! The truck below was decorated in a few hours and was a very fun experience for mom and daughter working together. The vinyl decals are shipped to you in a roll, with transfer tape on the top. Transfer tape looks like masking tape, but is not as sticky. The usefulness of this tape feature will become apparent later. Step 1 - use scissors and cut the decals into separate pieces. You can cut close to the edges of the decals, but on at least one side leave some space between the decal and the cut edge. This helps get the tape separated from the backing. Step 2 - We recommend you start with a small decal for which you have extras. The decals are easy to apply, and if you mess one up, it is likely to be the first one you start with. To apply the decal, peal the transfer tape from the backing. Make sure the decal sticks to the transfer tape, and not the backing. If the decal is sticking to the backing as you lift the transfer tape, stick the transfer tape back down and rub it firmly. The decal should want to stick to the transfer tape more than to the backing. 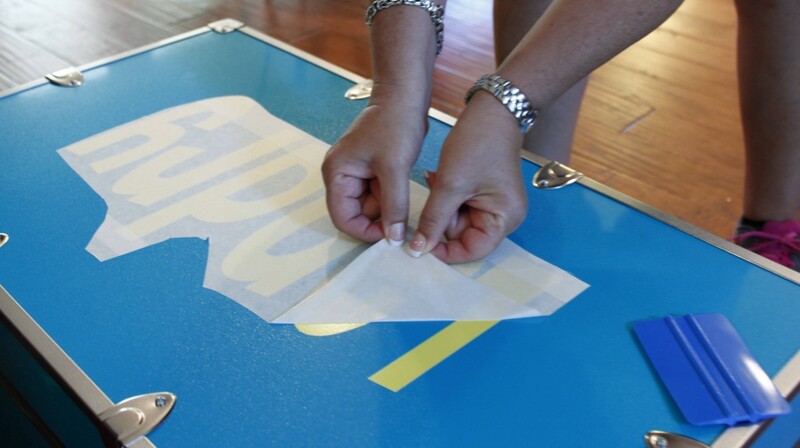 Apply the decal by starting from one edge and laying it down without allowing a crease or bubble to get in it. After the decal is down, and before you remove the transfer tape, use a credit card or squeegee to firmly tack down the decals. A credit card does work, but the blue 3M squeegee is easier to hold and slides better. Credit cards can have a sharp edge that wants to dig in, and do not slide or bend as well. 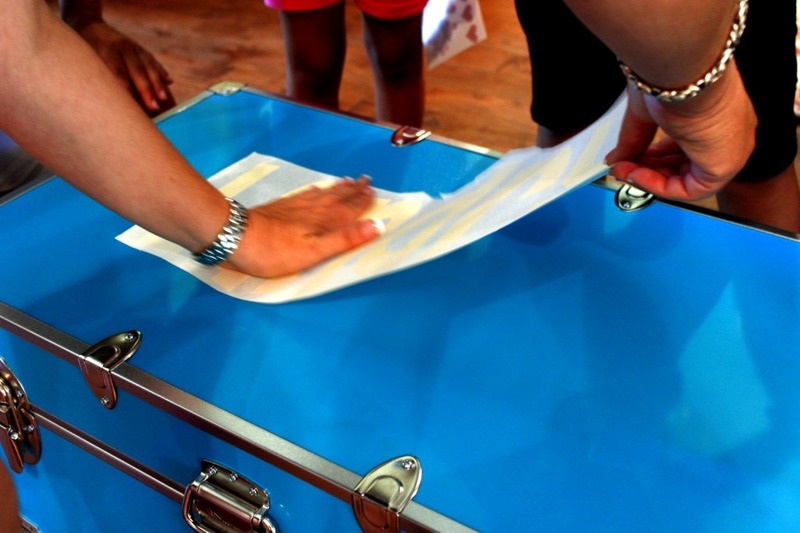 Should you get a bubble or crease, work it out from the vinyl center to the edge. One the decal is down firmly, remove the transfer tape by starting with an edge, and pulling the tape straight back. Don't pull it up, or it may lift the decal back up. Step 3 - Once you feel confident with applying a couple of smaller decals, we recommend placing the biggest decals, and then fit the smaller decals around the bigger ones. 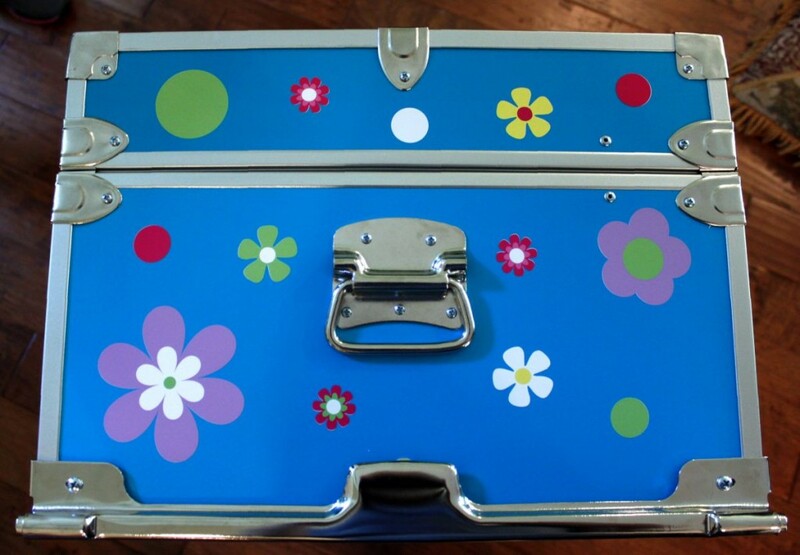 The biggest decal you have is likely the personalization. 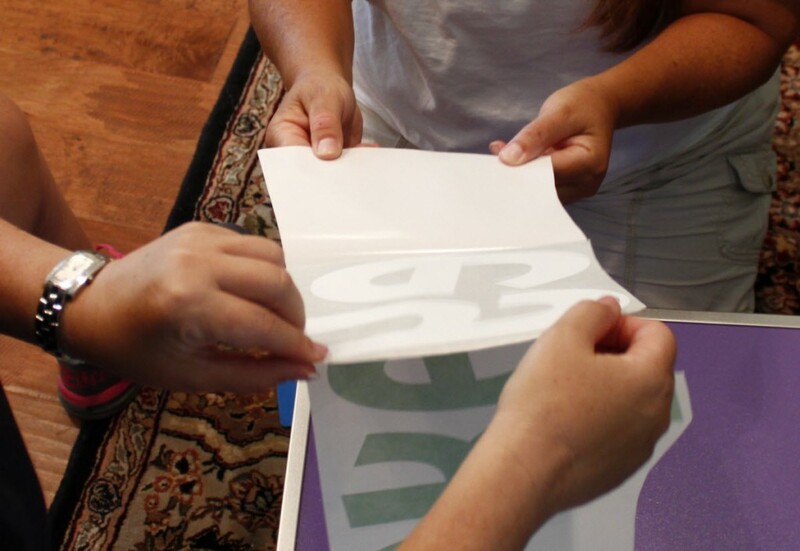 Getting the decal and transfer tape separated from the backing may be a two person job as shown below. Pull the two sides apart slowly, making sure the decals stay with the transfer tape. Sticking it down works just like the smaller decals you started with. Start with the edge of the name, and slowly stick it down without allowing a bubble or crease to get in. 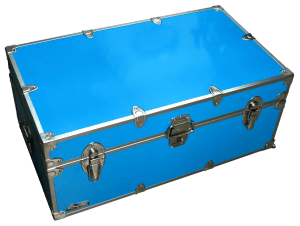 On trunks like this one, the power coated paint might have small high points that look like little bubbles - they don't rub out and you won't notice them on the finished product. After patting it down by hand, don't forget to squeegee or credit card it down tight. Place the biggest decals first. Apply them from one edge and carefully stick it down without allowing a crease or bubble. 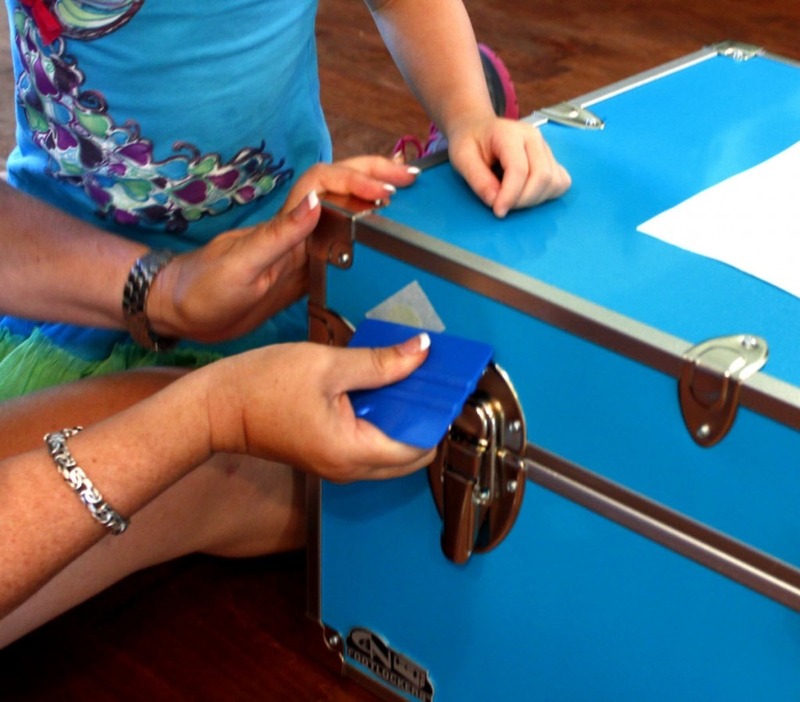 Just like the small decals, remove the transfer tape by pulling it straight back as demonstrated here. Be careful as the transfer tape pulls back from the leading edge of each letter, as that is the time a decal might want to lift up. Peel the transfer tape off by pulling it straight back - don't pull it up! With the personalized name in place, lay out the smaller elements around the big element to make an attractive design. It is just fine to lay vinyl on top of vinyl, so keep that option open. Most of our designs have lots of elements, more than you could really use. But keep in mind as you place elements on the top to not forget the front and sides need love too. This trunk end is ready to go! 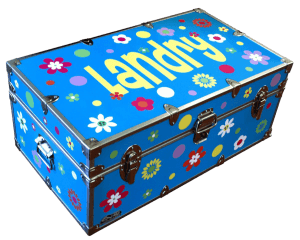 These trunks belong to cousins. Cousin Berkeley added soccer balls to her design to reflect her passion for the game and it looks great mixed in. 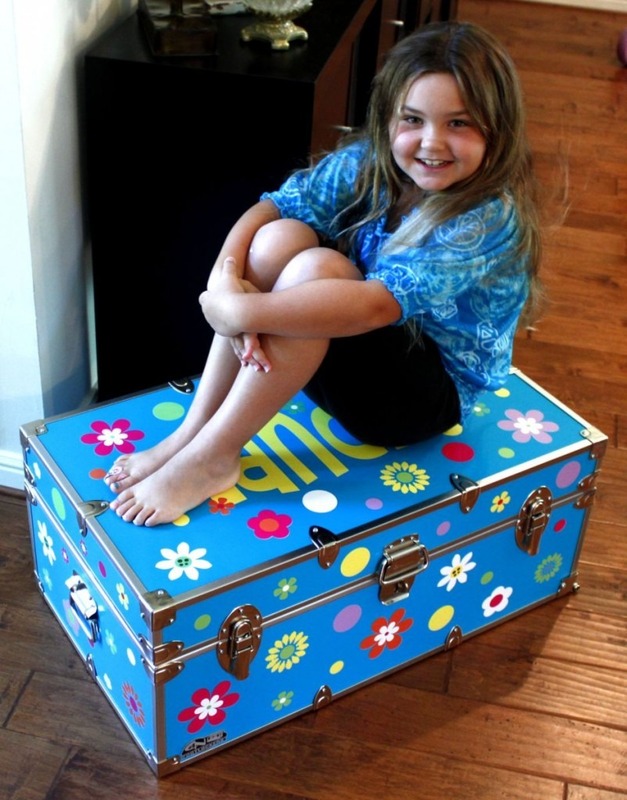 Make matching personalized summer camp trunk sets! 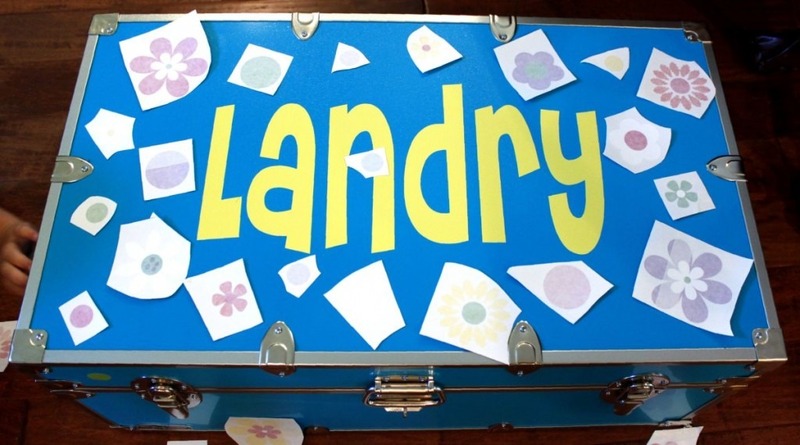 Landry lovers her personalized camp trunk, and had a great time decorating it with her mom and aunt, and cousin! This happy camper is all ready for camp!